Kathryn Cheney Merriam was very proud of her students and derived a great deal of satisfaction in seeing them learn to read. 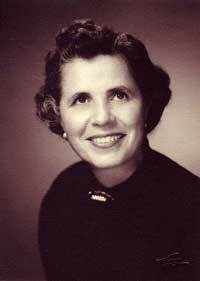 Born in Chicago, Illinois, in 1901 Kathryn Cheney Merriam's father was a pediatrician and her mother, who was active in the League of Women Voters, was the first woman to serve in the State of Illinois Legislature. Kathryn Cheney Merriam graduated from Northwestern University with a bachelor's degree in Psychology. The mother of four children, she was actively involved in the Brownies and Girl Scouts, the PTA, the American Association of University Women (AAUW), and also served as a library volunteer. She came to Santa Cruz in 1962 and became actively involved in the community. She was a founding member and coordinator of the Volunteer Service of Santa Cruz County. Within this agency her focus was promoting the adult literacy program. She was the coordinator and, for many years, a tutor for the "Each One Teach One" program. She was very proud of her students and derived a great deal of satisfaction in seeing them learn to read. From 1964 to 1967, she served as president of the American Association of University Women of Santa Cruz. She helped to reactivate the Community Council of Northern Santa Cruz County in 1966 and served as president from 1968 to 1970. In 1968 she was named Woman of the Year by the Santa Cruz Area Chamber of Commerce. In 1980 she received the Soroptomist Club's International Award for Women Helping Women. Kathryn Cheney Merriam passed away in March of 1986, at the age of 84. She was survived by her children, Dorothy Venolia, Carol Bockman, Charles E. Merriam, and Robert C. Merriam. For more information about this scholarship, please contact the Education Department by telephone (831) 459-2200 or visit the department's website.